Hydraulic fracturing ("fracking") as a method to stimulate shallow, hard rock oil wells began in the 1860s. It was used in Pennsylvania, New York, Kentucky, and West Virginia. Initial efforts used explosive nitroglycerin in oil, water, and gas wells. Nonexplosive acid for well stimulation was introduced in the 1930s. Acid etching prevented fractures from closing completely, enhancing recovery. The same phenomenon was later discovered with water injection. Slick water hydraulic fracturing is a technology used to extract natural gas and oil that lies within a shale rock formation thousands of feet beneath the earth’s surface. It is done by pumping water, sand, and chemicals at very high pressures into the well. The pressure cracks the rock around the injection site and the sand holds the cracks open after pressure is released. The actual process uses multiple steps and several different chemicals. The chemicals will change depending on the company doing the fracking and the characteristics of the formation. In addition, each company has steps that are proprietary, so very little information is available on the chemicals used. When the pressure from fracking is released, some of the fluids pumped into the well flow back to the surface. In addition to this “flowback” water, naturally occurring (produced) water also flows to the surface. After a short while, natural gas or oil will also flow. With time, the amount of injected water flowing back decreases while the produced water flow increases. A typical frack will use 3–5 million gallons of water and about 1/3 of the water injected will return to the surface. With all of these variables there is no way to predict water quality and it will change rather quickly for the first two weeks of flow. After two weeks, the majority of the flow is produced water which is regulated differently than frack water. For successful treatment of frack water, the fate of the wastewater must be known. In many states the frack water is injected into regulated deep wells – usually old drained gas or oil wells. The only water treatment usually necessary is filtration. This can be as simple as “sock” filters or as extensive as clarifiers depending on the solids loading. If there are a lot of new wells being drilled, the drilling companies will dilute 20:1 with fresh water and not worry about chemistry. When fresh water is not available, or only a few wells are being drilled, the water will have to be treated to meet the service companies’ specifications. 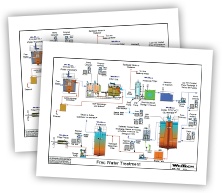 Since each company has different requirements, treatment processes vary but usually include filtration, chemical precipitation, and softening. Chemical usage is extremely high and sludge production may exceed 20 tons/day for a 200 gpm flow. When no opportunity for dilution is available, the first few days of wastewater flow can be treated and reused. When the total dissolved solids in the wastewater exceed 10,000 ppm, it can no longer be reused. The only options are deep well injection or zero liquid discharge by using evaporators and crystallizers. Some of the dry waste has been used for road salt but most has to be encased and buried.